Sometimes we do our best work while in exile or subject to persecution. It is in struggle that we find out of what we are truly made. We also find out that God sustains us every step of the way when otherwise we might meet with destruction. I know God has sent people into my life to whom I owe my very life. Each has saved me and sustained me at just the right time. But that is a story for another day. 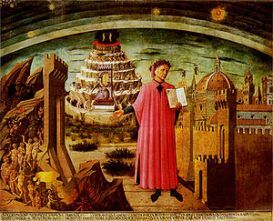 Dante, considered the greatest Christian poet, is the author of the greatest literary work in the Italian language. His masterpiece, which fostered the evolution of the Italian language itself, was written while in exile under the threat of being burned at the stake if he ever returned to Firenze. It is in our powerlessness that we often find God. As Dante wrote his epic poem “midway upon life’s journey” we too are almost midway through our Lenten journey. Today, the Chair of Peter lies empty. This Lent, we will certainly end up in a different place than where we started. Hopefully, we will be transformed individually and as a Church. Reflecting this journey, the Ash Wednesday Collect from the Roman Missal refers to Lent as “this campaign of Christian service…” Through this campaign, Lent is marked by two themes: preparation for baptism and penance. But Lent is also a joyful season with its expectation of resurrection and as a time of healing. This text from Psalm 139 is most loving and intimate – a mutual love poured out from our God and from His people who offer praise and thanksgiving to our Lord who watches over us and cares for us. I am risen and I am always with you. Christ, who suffered death on a cross for us, will never leave us comfortless or abandoned. Furthermore, the musical setting is thoroughly surprising to our modern sensibilities. The ancient modal scheme contains two surprises: one, that Easter Sunday begins with a series of minor intervals; two, that the first and final “alleluias” end unresolved, a half step below a modern “major key” resolution and a step above a modern “minor” resolution. In between and timeless – unresolved for eternity. “I am always with you.” Unlike a nice C Major hymn with organ and brass (and who doesn’t love that? Nothing wrong with that!) the Introit for Easter Sunday, Resurrexi, expresses the transcendent. Mode IV may be the ideal mode to express what Karl Rahner, S.J. identifies as surrender to the “incomprehensible Mystery called God.” The “unresolved” ending is in fact strangely satisfying. It reveals without words an act of faith. It expresses the ineffable mystery that is the Resurrection, the eternity of God and God’s love for us. At times in life, we may be in exile. We may be persecuted. We will suffer in ways we don’t deserve, nor expect. Some will suffer the unfathomable cruelty of great tragedy. But exile is where we find God closest to us. We find the God who never abandons us and will never leave us comfortless. It is in exile that we find our true calling from God.